So I’m doing something a bit different today, but I wanted to talk about a brand I’ve really been liking these days. Usually when I think about a brand I like, it’s mostly about the products, and since I have virtually no actual brand loyalty, that changes as often as my routine. But lately, I’ve settled into a kind of set routine, where I love all the products I’m currently using, and I don’t feel any need to explore for the time being. And two of those products (one of the two brands that boast two items in my routine from the same brand) come from Jordan Samuel Skin. Jordan Samuel Skin is the labor of love of founder Jordan Pacitti, a former corps de ballet dancer with the Pacific Northwest Ballet. Now, if you’ve followed this blog for a while, though its various incarnations, you may remember that I returned to ballet at age 30 after not dancing since the age of 7. I’ve always loved ballet and part of me wonders what could have been if I’d had a more supportive teacher when I was a child. So of course, I was immediately drawn to the aesthetic of a brand developed by a ballet dancer for the challenges that a dancer faces. Incidentally, the issues of late nights, lots of makeup, and sweating under stage lights also apply to actors! I also found Jordan’s YouTube videos “Jordan Samuels Skin Talks” and found his personality engaging and fun. He just seems like such a nice guy (and he has cats, so how could that be bad?). So I splurged and bought myself a bottle of his Etoile facial oil, a blend of luxurious plant oils with a price tag that is actually less than a lot of the blended facial oils on the market. He also doesn’t put any fragrance or essential oils in his products, which my finicky skin appreciates. From the time you receive your package, you feel the care that goes into each order. No, Jordan doesn’t personally write the note in each package, but the printed handwriting suggests a level of intimacy, like a friend just sent you a gift. The packaging is understated and elegant. The whole experience is highly Instagram-able, which I imagine is part of his strategy. Oh, and he does social media so well. While I don’t flatter myself that Jordan himself responds to every YouTube comment and Instagram message, every comment and message does get a response. When I tag the brand on Instagram, I get a comment or a response (if it’s a Story). I even got a completely-unrelated compliment on my hair after tagging the brand in a Story! And they’re highly receptive to questions about products on Instagram messages. I feel a connection. They’re social media game is on point, which is so important, particularly when other brands can either feel disconnected or unwilling to engage constructively. But what about the products? 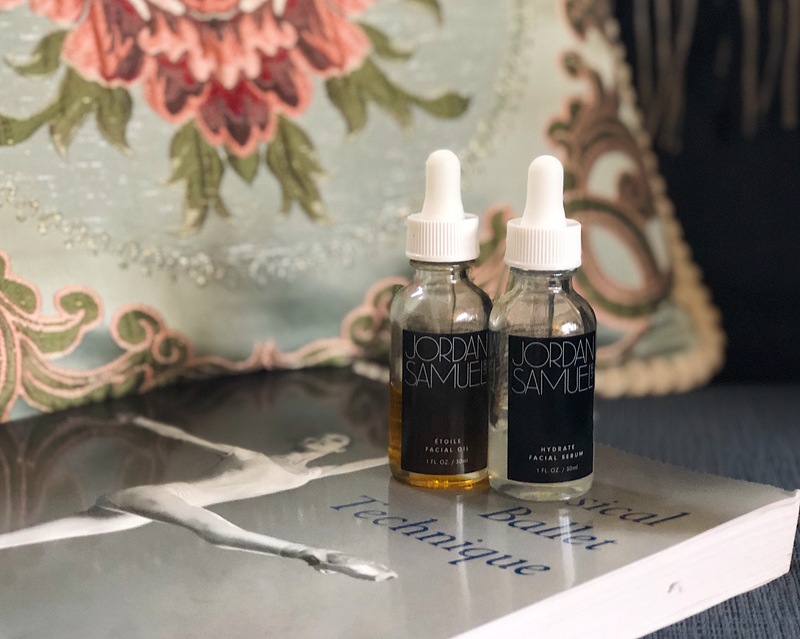 Well, I’ve tried two products from Jordan Samuel — the aforementioned Etoile Facial Oil, and his Hydrate Serum — and I love them both. They’re kind of like your favorite pair of ballet tights — a good pair should be almost unnoticeable, but they give your legs a smooth line and subtly lifted look to help you see your muscles work. In the same way, both of these products are go-to for one simple reason: my skin looks better when I use them than when I don’t. The Etoile Facial Oil is a blend of plant oils with a balanced fatty acid profile. It’s a beautiful amber color from the natural unrefined oils, and it has no scent. It goes on with a noticeable slip, and I find it a bit oily for daytime use, most of the time, but it’s lovely at night. I pat on 5-7 drops every night after my hydrating steps and before my final cream layer, and I find I wake up with a refreshed glow. When the weather is warmer, I can even use Etoile as my final nighttime step. When it’s very cold outside, I’ll use 3 drops of Etoile in the morning to supplement my daytime routine, or as a protective layer before exercising outside in the cold. There’s also a version with retinol, which I’m going to try once I’ve figured this whole conception/pregnancy thing out and don’t feel conflicted about retinol. The Hydrate Serum is just that: a fairly basic hydrating serum. It has hyaluronic acid and glycerin, some soothing plant extracts, a touch of stable vitamin C (not enough to replace a dedicated antioxidant serum), and a peptide for skin health. It has no fragrance ingredients, but it does have a light powdery-natural scent from the plant extracts. It’s a thin gel that goes on very juicy onto the skin, and absorbs without stickiness. My skin drinks this up, morning and night, and looks plump and refreshed. Again, I feel like I have a glow with this serum that I don’t notice with other, supposedly similar, products. I’m about 3/4 of the way through my first bottle and I’m definitely springing for the 4-oz. bottle when I need a refill. I like to slather. I use about a pearl-sized amount in the morning before cream and sunscreen, and a slightly larger amount in the evening before facial oil and cream. So I’ve definitely been enjoying these two products. Given that I’ve spent the last several months paring down my routine, keeping two things from the same brand is high praise. I hope you’ll check it out. I get nothing out of it, other than appreciating that a brand I like is doing well!